With the Chinese looking to gain an infrastructure funding foothold in East Timor, here is the opportunity for Australia to test its newfound commitment to major infrastructure funding for its Pacific and Timorese neighbours. Michael Sainsbury reports. WHILE SCOTT MORRISON was busy visiting Pacific nations thousands of kilometres to the east of Australia last week, the political stalemate in Australia’s closest neighbour, East Timor, only 700 km north-east of Darwin now into its ninth month escalated further. On 23 January, its president Francisco “Lu’Olo” Guterres, 64, vetoed the $US2 billion 2019 budget. Guterres will have lingered the full 30 days, or very close to it, he has to decide whether to pass or veto a budget sent to him on Christmas Eve. The uncertainty over the budget – the government now has 90 days to resubmit a new budget and state spending that heavily underpins the economy of Southeast Asia’ newest and poorest nation – has caused consternation in the country’s troubled business sector and is roiling the country’s fragile economy. Companies are closing their doors and laying off staff. The effective leader of the government Xanana Gusmão, 73 – although he is without portfolio – elder statesman, revolutionary hero and former president (2002-2007) and prime minister (2007-2015) can now deliver on his threat to fund the purchase of $US300 million on energy assets from US giant ConocoPhilips using the country’s sovereign wealth fund — and that, many are convinced, means billions of dollars in Chinese infrastructure funding down the track. The budget veto is just the latest blow to the 1.3 million, mainly impoverished Timorese, inflicted by a political stand-off between the same ageing men that have dominated the country’s politics since its 2002 independence. Guterres, who comes from the opposition Fretilin party, also continues to hold out on nine nominations for ministerial positions that have been disputed – on concerns over corruption – since the May, 2018 general election. That was won by the three-party coalition, Alliance for Progress and Change, lead by Prime Minister José Maria Vasconcelos, widely known by his “nom de guerre” Taur Matan Ruak, 62, but effectively controlled by the country’s Gusmão resulting in an uncomfortable power-sharing, or co-habitation arrangement for the first time in the country’s 16-year history. In the lead up to this week’s decision, Guterres was forced by the parliament into accepting changes to the Petroleum Activities Law, after a bill he had originally vetoed after it was first passed by parliament in late 2018 was returned to him. It was voted by 41 votes to 1, after the opposition Fretilin party’s 23 members in the 65 seat legislature did not show up, refusing to vote. The legislation removes the nominal 20 per cent limit of ownership on state ownership of oil and gas assets, clearing a path for the the Timorese government to spend $US650m on the combined 58.4 per cent stakes in the Greater Sunrise consortium that has been lead by Australia’s Woodside Ltd, of ConocoPhillips and Royal Dutch Shell that controls the eponymous undersea gas reserve that lies between the tiny half island nation and Australia. The new law also gave retrospective cover to the government, which has already inked contracts above the nominal limit. Crucially, critics say, the legislation takes oil and gas investments away from the purview of the government’s Audit Chamber. “The proposed legislation removes all petroleum-related contracts and other related legal documents from prior review by the Audit Chamber, forever. It is not limited to purchase agreements, or to Sunrise, and could also apply to financing agreements for any petroleum-related project,“ Dili-based NGO La’o Hamutuk has noted. Fretilin has made the same complaint and Gusmão has described his schemes as “too complex” for state auditors. Mr Gusmão’s long held plan is to to build a pipeline from the undersea Greater Sunrise reserve to the isolated south coast of the island nation to process natural gas into liquefied natural gas for export — at this stage, probably to the consortium’s 10 per cent shareholder Japan’s Osaka Gas. While there is at least nominal universal political support for a version of the Tasi Mane plan, which involves three major infrastructure projects along the south coast – a supply base including an airport a gas landing base and a processing plant– the devil, the opposition and other critics believe, is in the detail, or lack of it. Dili-based NGO La’o Hamutuk’s has estimated that Tasi Mane’s total cost of the Greater Sunrise acquisitions offshore development and Tasi Mane infrastructure is $US15.85 billion, higher than the government’s own estimate of $US10.5 billion. At present, Fretilin does not officially agree or disagree with Mr Gusmão ’s plans; rather it has called for the the process to be transparent and better discussions conducted with all stakeholders, particularly the opposition parties. It has charged that the process has been “a closely guarded secret” and no information has been shared with anyone and “we suspect not even the PM knows everything that goes on”, one Fretilin insider noted, a view also held by others outside the party. Fretilin and others have repeatedly asked the negotiating team lead by Mr Gusmão to disclose all documents, such as independent technical and commercial viability studies — yet none have been forthcoming. Firming up his position as the nation’s energy tsar in August 2018, Mr Gusmão was appointed Special Representative of Timor-Leste for the conclusion of the procedures necessary for the ratification of the Treaty between the Democratic Republic of Timor-Leste and Australia establishing their maritime borders in the Timor Sea, the acquisition of interests in oil fields and the conclusion of agreements relating to the development of the Greater Sunrise oil fields. This followed his triumphant re-negotiation of long disputed maritime boundaries with Australia in 2017, a deal. Significantly, signed off just ahead of the May 2018 election. In a move designed to garner public support – and critics say push nationalist sentiment – on 8 December 2018, Mr Gusmão held a public meeting at the Dili Convention Centre that was televised live to the nation explaining his project. While Fretilin remained unsatisfied, there are cracks appearing in opposition to the plan with former PM, president and 1996 Nobel Peace Laureate Jose Ramos-Horta, 69, breaking with Fretilin leader Mari Alkatiri, who included him as a minister in his 2017-2018 government, to support Mr Gusmão ’s plan. “I was there on December 8th in Dili Convention Center listening to the Prime Minister and listening to Xanana Gusmão explain about Greater Sunrise and the Tasi Mane concept. I was also there on 8 January in parliament all day listening to Maun Bo’ot (Big Brother) Xanana. He patiently answered every question,” Mr Ramos-Horta told The Australian. “In the past I have had doubts about economic and commercial viability and sustainability of the project. That’s why I was there to listen. And I was convinced about the viability the Tasi Mane Project. Mr. Xanana Gusmão presented all the data, all the facts and all the arguments. I don’t understand why some members of the parliament are questioning it,” he said, noting that while Dr. Alkatiri had supported a pipeline to Timor “many times”. “He has been saying it since 2000 and supported it again last year… the during the last phase of negotiations (with ConocoPhillips). “So if the Secretary General (Dr Alkatiri) of the party has supported pipeline coming to Timor-Leste, then why we do not support the investment — because you cannot just bring the pipeline but you also have to build infrastructure. We all talk about diversification economy so…. we use Greater Sunrise to create industries that meet our desire to have diversified economy. These comments go to the heart of concerns that the old guard of Timorese politicians, lead always by Mr Gusmão, who were at the centre of the country’s independence, are hanging on for too long; Mr Gusmão was the country’s inaugural president and Dr Alkatiri its first prime minister and that they, and Mr Guterres along with many others are playing often deeply person political games at the expense of the country. “The respect for elders that is incredibly deeply ingrained in the culture, which is very hierarchical — to go against these senior leaders would be actually unimaginable to most people. This is doubly true because they are veterans and are the reason the country has its independence,” Dr Sara Niner, a Timorese expert and lecturer in Anthropology at Monash University said. But while many have agitated for a new generation of leaders, it seems the path is set for now. Hanging in the air is the question of how such a massive project, whose cost may run into close to a decade of budget spending for the country and the entire current value of the Petroleum Fund (presently at about $US17 billion), will be funded. This raises the spectre that looms across the Asia Pacific of Chinese involvement, a key reason for Mr Morrison’s announcement in November of a $3 billion plan for the Pacific and East Timor and his subsequent cent tour of Vanuatu and Fiji. Pushing the point, Mr Gusmão told local media on 15 January: “He (the president) can veto the 2019 state budget (which contains the payment to ConocoPhillips of $US350 million — further the $US300 million payment to Shell is not due until 2020), but it is no problem. Many observers believe that Mr Gusmão was referring to Chinese money. Chinese state-owned companies have already nabbed major contracts for infrastructure on the south coast including a port and airport extension at Suai; a road linking the country’s number two city Bacau with Viveque, on the south coast; and, for digital television. Mr Gusmão has also said that East Timor’s government will not fund more than 20 per cent of the project, leaving at least $US8 billion to be sourced elsewhere. “So the veto will not shoot down all the ways for us to buy it. If we will borrow ($US650 million) we will pay back it with the interest from our capital expenditure, so there is no problem,” Mr Gusmão said. 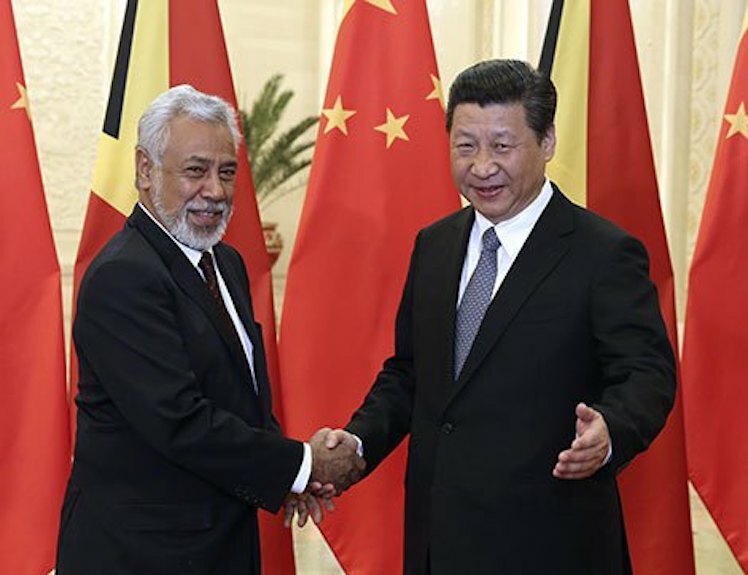 Ruinous project in East Timor could open door to China Xanana Gusmao's plans for exploiting the Greater Sunrise petroleum field carry significant risks for this nation and Australia. The Australian government has made it clear it will work with whatever decisions Dili makes on its energy strategy, although it has traditionally tended to follow the lead of ASX listed Woodside, which has maintained its stance that Mr Gusmão’s project is not its preferred option, but it soon to be a minority player in Greater Sunrise with only a 34.5 per cent stake. It is understood that Woodside is now resigned to the Timor pipeline but has made it clear to Dili it will not fund any of the infrastructure on the South Coast. Any obvious influx of Chinese money would cause serious consternation in Canberra, which remains East Timor’s largest single aid donor with a commitment of $90 million in Overseas Development Aid in 2018-2019. It moved to normalise relations with Dili, following the conclusion of the new maritime boundaries last year with Foreign Minister Julie Bishop becoming the first federal Cabinet Minister to visit the country in five years. Ultimately it was concerns about China – both in terms of its aid to the region and its rising defence capability – that finally motivated Australia’s leaders to make a strategic decision to take the region seriously. But Mr Gusmão has renowned diplomatic savvy and an example of how he may bring Chinese money into the country with “declaring war” on Canberra given current sensitivities, can be seen in the way the new deep water Tibar Port outside Dili, where construction commenced in Sep. 2018, has been handled. The prime contract, worth $US490 million, was handed to French group Bolloré Group in 2016 that, a year later, sub-contracted construction and operations to Chinese group China Harbour Engineering Company (CHEC), a subsidiary of China Communications Construction Company Limited (CCCC) which had previously been banned from all World Bank financed contracts for roads and bridges, but not ports. The World Bank’s venture capital arm, the International Finance Corporation is an investor in the Tibar Port. “East Timor is unfinished business,” one former senior bureaucrat noted. “In many ways, it is the missing piece of the Pacific plan.” While East Timor has been included in new aid, employment and potential infrastructure lending plans in the Coalition’s latest Pacific plan; doubtless Canberra is keeping an eye on the nation’s – and senior government officials – growing Chinese connections. Further complicating things for Australia is the ongoing prosecution of the Witness K, the Australian spy who revealed, through designated proper legal channels, that then Foreign Minister Alexander Downer authorised spying on East Timor during 2004 maritime negotiations. Also being prosecuted is his lawyer, former ACT Attorney-General Bernard Collaery who acted for East Timor in its recent border negotiations with Australia and is held in extremely high regard in the country, with which he has decades long connections. Still, this year’s 20th anniversary of the September 1999 vote for independence and the arrival, two months later, of the Australian-led Interfet (International Force East Timor) peacekeeping force, provides a further opportunity to repair the bonds between the two nations that have remained string at a grassroots level including the significant Timorese diaspora in Australia. Preparations are already underway or celebrations in the second half of the year with Mr Gusmão, unsurprisingly, appearing at the helm on the Timorese side and it also might be expected that whoever is Australia’s PM after the scheduled May election might pay an overdue visit. In the interim, there is scope for a range of possibilities in the nation’s troubled political sphere, including according to Dr Leach, a third election in as many years where Gusmão hopes to use his pet project as a nationalist wedge against Fretilin, as well as the hurdle of Woodside’s official agreement which still needs to be overcome. “But while there is no guarantee that there will be a different result, if Gusmão s AMP and its allies can pick up one more seat from Fretilin it will have the required two-thirds majority to nullify any presidential vetoes, significantly weakening the president’s hand,” Dr Leach said. Increasingly, it looks like an opportunity for Australia to test its newfound commitment to major infrastructure funding for its Pacific and Timorese neighbours before China establishes an even stronger foothold. PreviousBrookfield bid for Heathscope: a tax haven special?